Source: ScreenRant. Animated Gifs: Tumblr. The Star Wars: The Last Jedi trailer has a lot more reveals than the previous teaser, but somehow most of the movie is still shrouded in mystery. The movie is going to release in just over 2 months time, and Lucasfilm’s spoiler avoidant marketing appears to have been more than successful at making it look exciting and interesting without giving away any major plot details that otherwise wise ruin the movie’s twists and turns. Even so, there’s still a good a deal of information to be gleaned from the two and a half minute trailer in order to confirm rumors, give credence to fan theories, or spawn entirely new paths of speculation. While The Force Awakens didn’t establish much about the First Order other than some of its military capabilities, including Starkiller Base, The Last Jediseems to be taking us into the heart of the First Order’s infrastructure, which is likely Supreme Leader Snoke’s Mega-Class Star Destroyer – the Supremacy. The Supremacy is massive and is said to be used to not only house large numbers of ships and infantry, but it also has the ability to construct First Order Star Destroyers. We know Kylo Ren is returning to Snoke at the end of The Force Awakens, so when we see him sans helmet and cape overlooking a massive hanger and the construction of Gorilla Walkers, AT-AT’s and more, it seems logical to assume that’s where he is. While Snoke was just a hologram last time we saw him, we are now near the center of his operation, meaning there may be quite a few reveals to be had regarding the inner functions of the First Order from shipbuilding and troop training to maybe even some sort of its political machinations. The massive battle teased at Crait is being set up as one of the most iconic moments of the movie with the planet’s red color visible under the thin layer of salt, creating a colorful effect when it’s disturbed such as when resistance ski-speeders fly over it. While not much is known about what makes Crait important and why the First Order and Resistance have chosen it as the best place to face off, several new images from the trailer help fill in the gaps. First is the All Terrain MegaCaliber Six, AKA the AT-M6, AKA “gorilla walkers.” This may not be the first time they’ve been revealed in the movie’s marketing, but the line of heavy war machines is bound to pose a threat to the resistance. Interesting enough, the lineup also features what appear to be classic All Terrain Armored Transport (AT-AT) walkers with a slightly updated head. Assuming they’re the same size as the original models, it just shows how vast the Gorilla Walkers actually are and also suggests that the AT-M& isn’t merely an AT-AT replacement, but that the vehicle may serve a distinctly different purpose altogether. It’s hard to read too much into this because entire battle devoid of context, but a shot of Resistance soldiers and some sort of crystalline looking fox creatures fleeing toward a hanger suggests maybe it doesn’t go so well for the Resistance. Kylo Ren seemed unstoppable in his first appearance onscreen when he stops a blaster bolt with the Force, but by the end of the movie we see him bested by the untrained newcomer, Rey, and Snoke commands Ren return to him to complete his training. While we’ve seen plenty of established dark side master/apprentice relationships in the history of Star Wars with Darth Sidious’ apprentices from Darth Maul to Darth Tyrannus (Count Dooku) to Darth Vader, most of these relationships appear on screen fully formed. Vader turns to the dark side at the end of Revenge of the Sith and by the time we get to A New Hope, he seems to have the villain thing all sorted out, with all that development happening in non-movie stories. Kylo Ren is different. Kylo Ren has only been training under Snoke for a few years, and the fact that Snoke has more to teach him about the Force means that, while they aren’t Sith, we may finally get a better glimpse of that dark relationship here. What’s apparent from the trailer is that Ren has to submit himself to Snoke. We see him in a completely red room, presumably Snoke’s throne room, with Praetorian guards around the perimeter, and Ren has to pick up his lightsaber from the floor, which is an odd place for him to leave it, suggesting he had to set it down to kneel or subjugate himself before his master. While this isn’t a big reveal in and of itself, it’s definitely a major change from his interaction with the giant hologram of Episode VII. This trailer, however, gives us a lot more, but it might not be the Luke some fans want. He seems uncertain of himself and suspicious of Rey. When he sees just how much “raw power” she has, he tells her “I’ve seen this raw strength only once before it didn’t scare me enough then. It does now.” While admitting he’s scared is not necessarily the same thing as giving in to fear, it nonetheless presents the question. As we all know, fear is the path to the dark side – the same path his father took to get there. Han said Luke’s objective in going into hiding was to discover the first Jedi Temple, which made it sound like maybe he was in exile because he was seeking wisdom, knowledge, or some other source of aid, but maybe it’s fear that’s keeping him on Ahch-To now. Fear of failure, fear of inadequacy, fear that he himself will fall to the dark side. Either way, the courageous bright-eyed young man that destroyed the first Death Star and brought Anakin Skywalker back from the dark side is nowhere to be seen in Luke’s face in this trailer. Leading up to The Force Awakens, Star Wars canon seemed to have an interesting focus on these Force trees. The Shattered Empire comic book set right after Return of the Jedi sees Luke and Shara Bey, Poe Dameron’s mother, go to one of Sheev Palpatine’s secret research outposts to recover two sapling trees he cut from the giant tree in the courtyard of the Jedi Temple on Coruscant. The trees were strong in the Force and it seemed like they would be central to rebuilding the Jedi Order, but he gave one away to the Dameron family when they settled on Yavin IV and kept the other, which we have yet to see again. If the trees have some sort of connection to the Jedi Order, or particularly Jedi Temples, then it stands to reason that the first Jedi Temple on Ahch-To might also be the site of one of the oldest trees. Or, as we see in this newest trailer, the old tree and the first Jedi Temple may be one in the same. We already saw the ancient books bearing the Jedi sigil inside what could be assumed to be a tree from the last trailer, but when we see that shot again here, it’s placed right after a shot of Rey approaching a very big very old very dead tree, suggesting it houses the little library. While the dead tree very well may be representative of Luke’s faith in the Jedi way, it’s also a symbol of the Jedi Order itself, which is all but dead. It would be very symbolic for Luke to have planted the sapling Force tree near that site, but considering he only came to Ahch-To after an attempt to start another Jedi Academy, it’s highly possible that sapling was destroyed with his academy, meaning the last of the Force trees is gone, as the Jedi are about to be. 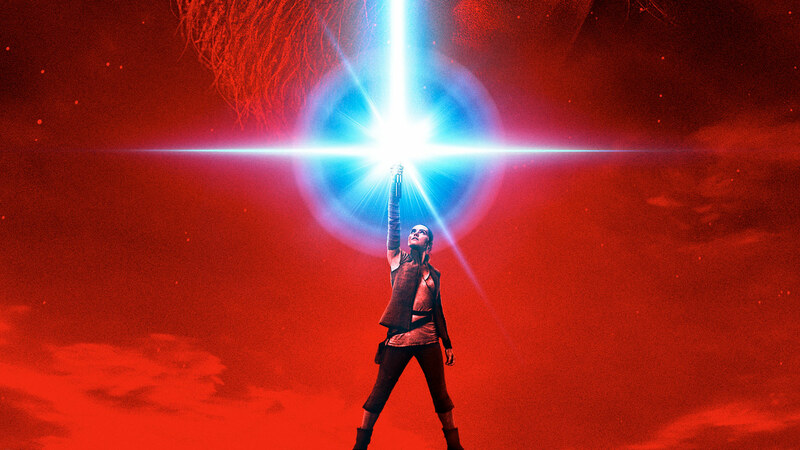 The Last Jedi will only be the second new Star Wars episode of the new era, but we’ve already seen some impressive displays of Force powers, from Ren stopping a blaster bolt in mid-air to Rey learning how to tap into an innate connection to the Force and defeat Kylo Ren in combat. This trailer is all about that new, intense power. In the opening, Snoke calls it “raw, untamed power,” and Luke, likewise, calls it “raw strength.” Looking back on the title of The Force Awakens, the decision to call it that might be making a little more sense. We hear Rey saying “something inside me has always been there, but now it’s awake and I need help,” so it’s clear she’s feeling it now even more than she was before, and Luke is obviously shocked by her power in a way that actually makes him concerned, and he suggests that he’s only felt that kind of power when he was training his nephew. What makes this most interesting is that, while Snoke and Luke both use the term “raw” here, Snoke craves that power while Luke is “scared” by it. Is the trailer’s audio editing tricky and they’re both talking to Rey, or are Rey and Ren unique in that they both have a uniquely raw strength? A mysterious entry in the databank on StarWars.com has always said that the two are linked by a “mysterious connection.” Whatever that connection is, it seems Luke can feel it. Exactly what makes Star Wars Star Wars has always been, and probably will always be, up for debate, but there are a number of consistent factors in each of the movies many people can agree on, and one of those is the fact that Star Wars doesn’t ever use flashbacks. This unspoken rule was broken in Rogue One: A Star Wars Story, but that wasn’t an actual “episode,” and was intended to stray outside certain conventions. This was a big question leading up to The Force Awakens because there were some moments in the trailers that looked like they could actually be flashbacks, only for it to be a “Forceback” vision/dream Rey had when first making contact with the old Skywalker lightsaber. This same conflict is front and center again in The Last Jedi when he takes off his helmet – revealing a fancy synth-skin bandage on his face where Rey slashed him during their battle – and begins smashing his headgear against the wall, possibly leading to the image of the helmet and mask laying destroyed on the ground from the first trailer. Being Star Wars, fans are naturally curious if Ren will seek redemption, or if it’s even possible after he killed the Jedi and Han Solo. Whatever the case, it likely won’t just be fans wondering if Ren will continue down this dark path as far as it will take him, or if he’ll ever try to be Ben Solo again. The ashes of Starkiller Base are still hot when the movie first starts, and the First Order knows exactly where to find the Resistance, so they’ll be headed straight to the base on D’Qar as the resistance attempts to flee. Based on a few shots of space combat in which D’Qar’s asteroid belt can be seen, the First Order, with at least a couple Star Destroyers and what’s bound to be numerous TIE fighters, can be seen taking down a good number of the fleeing Resistance ships as they presumably try to jump to Crait. Poe Dameron, who otherwise doesn’t get much attention this trailer, has a big part in this battle as we see him engaging both TIE’s and a Star Destroyer as well as utilizing his fancy extra booster on the back of his X-Wing. While the initial reveal that he has this upgrade made it sound like it was intended to help him escape tight spots, the trailer shows him using it to hurtle towards the First Order’s oncoming D’Qar invasion force.